Tired of shaving, waxing and dealing with unwanted hair? The concept of removing unwanted hair from various areas on the body, quickly, easily, effectively and with minimal discomfort, has been a dream for many people. Through the use of medical lasers and intense pulsed light, this is no longer a concept, but a reality. Laser hair removal for unwanted hair is a very common cosmetic procedures performed in the United States. For men and women you can remove unwanted hair from your arms, legs, underarm, bikini area, face, chest and back. Learn how laser hair removal can remove unwanted hair over a course of treatments. Quality laser hair removal is a safe and effective procedure with no to minimal discomfort. WHAT TYPE OF LASER HAIR REMOVAL TECHNOLOGIES ARE OFFERED AT BAXT COSMEDICAL®? At BAXT CosMedical®, we have two different laser hair removal methods: a laser and an intense pulsed light source (IPL). 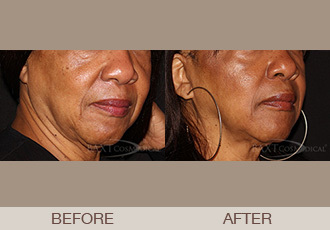 Laser or IPL emits light at a wavelength that is targeted at melanin in the hair follicle. Melanin is the material that gives color to hair. It is important not to have a tan while being treated with most lasers. However, the intense pulsed light can be used safely on dark skin. It is important to understand the hair growth cycle to appreciate how this technology works. At any given time, a certain percentage of hairs are in the “resting” phase. The laser will not be effective on these hairs, which is why multiple treatments will be necessary in each area for the maximum result. Subsequent treatments can be done as soon as further hair growth appears. Sometimes there are medical reasons for too much hair growth and the doctor can evaluate and make treatment recommendations, sometimes blood work is required. This can be discussed at the time of your laser hair removal consultation. Our Board Certified Dermatologists have dozens of years of experience with Laser Hair Removal and will discuss with you which advanced hair removal technology is best for your hair and skin type. WHAT BENEFITS CAN YOU EXPECT BENEFIT FROM LASER HAIR REMOVAL? The lasers and light sources used at BAXT CosMedical® are FDA cleared for “permanent” hair reduction, which means reduction over time*. Some men and women will see long term hair removal, where others may require maintenance treatments over time to maintain their degree of hair loss. BAXT CosMedical® laser hair removal dermatologists explain to patients that most patients require multiple treatments (2 to 6) and see noticeable results or are free of unwanted hair for several months. When the hair does regrow it tends to be lighter and finer in texture*. CAN MEN BENEFIT FROM LASER HAIR REMOVAL? For some men their back and chest may be covered with thick, coarse hair. Some men find this excessive hair to be uncomfortable and unsightly. Men can benefit from laser hair removal to remove and decrease unwanted hair. *Actual patient. Results may vary and are not guaranteed. Dr. Saida Baxt and Dr. Rebecca Baxt advise laser hair removal patients to exercise caution when selecting a laser hair removal clinic or services offered in medical spas. Beware of packages that make you have a treatment every month as hair grows at different rates in various areas of the body. At BAXT CosMedical® we tailor our treatment protocols as medically indicated, so you don’t end up with extra treatments that you don’t need. A final caution is to be aware of clinics or laser doctors that rent their lasers and only do laser once a month, they are not very experienced. We own all our lasers and lights, and we perform treatments every day. It is important that each patient interested in laser hair removal be properly evaluated prior to laser or light treatment for hair removal and we look forward to doing this with you. Call or contact us online today to schedule an appointment with a BAXT CosMedical® Dermatologist. *Results may vary on different patients and are not guaranteed.